Have you ever been alone and start muttering random gibberish? It’s more common than you’d think actually. Look back on a time when you were left alone for a brief moment of time and started questioning things. Did you find that moment? Okay good, now imagine if you were to transform that moment into something more than just pointless talking. As a language learner you should always be formulating new solutions to help you with your journey to fluency, so if you’re as creative as I am you’ve probably figured out where I’m headed with this article. He’s gonna tell us to speak our target language in our moments of blabbering. Well, you’re not wrong if you thought that, but I’ll do you one better than that. I’m going to guide you on how to use the technique I like to call the blabbering technique. Blabbering for short is just simple blabber your mouth makes when it or you get bored. How many times do you get bored during the day and can’t find ways to make up for it besides talking? Go on count the number of times on your fingers and toes because I’m sure you’ll be needing more than 10 of anything to account for this number. Now that the intro is out of the way it’s time to get into the technicalities of this creative language learning technique. This technique lacks structure, but that is what also makes it unique. Think of language as one big pile of messy leaves. To start, you’re going to want to be alone. You might come off a little bit estranged if you started blabbering in the middle of a crowded area in a foreign language. Let your mind wander as time passes by, and as the thoughts begin to flow in your mind – don’t think about them any longer, speak them out loudly (or softly) your choice honestly. And yeah I know I said let your thoughts flow, but if you can interject a question or two here and there while thinking you can make this process more effective. Here is a rule of thumb when using the Blabbering Technique: Always have an answer to everything… even statements. Me: Why is the sky blue? Also Me: Because of the ocean, duh? Also, Me: So are plants green? Me: Of course not, flowers can be colorful. Also Me: Yeah, but have you ever seen a colorful plant stem? Imagine you’re walking down the road and you see a car driving by. You Again: Oh I see you’re red, I like red too. You: Red is the color of love. You want to make sure you are blabbering and thinking about clever exchanges such as this one for example. What Does Blabbering Do In Language Learning? 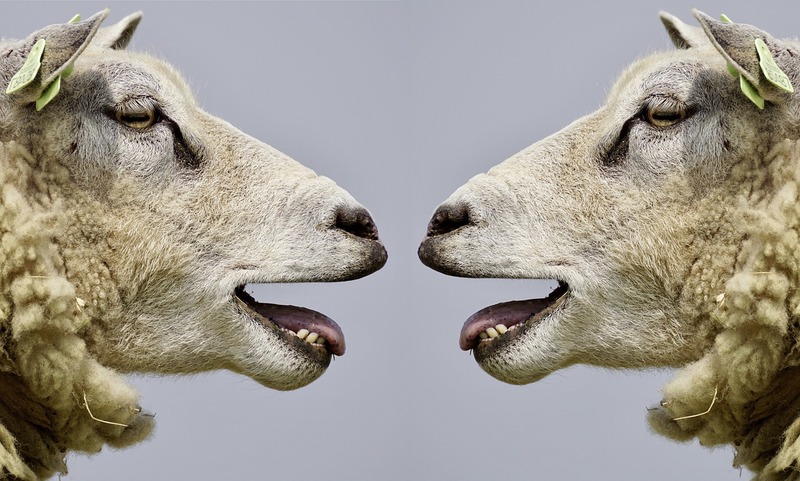 The blabbering technique’s main purpose is to get you thinking in your target language. The rapid flow of thoughts being outputted into your reality will create a kind of synchrony between your mind and your mouth. Aside from that, it allows you to ask questions, no matter how silly they may be – they are interesting. Have you ever seen a colorful plant stem? Or are they all green? Questions are like the trigger button when it comes to starting conversations. The interest level of your questions will determine how long the conversation lasts. A “How is the weather today?” question will probably grant you a 5-10 second conversation you may even be able to squeeze out 30 seconds. But, unless you or your conversation partner is a seasoned meteorologist, you shouldn’t be expecting much. However, if you were to try asking a question like this for example: Is water wet? You are going to get some heads to turn because it is not something people usually stop to think about. Instead, thoughts like this stayed locked up in the back of people’s heads; blabbering is there to bring those thoughts out so that they can be further explored. The blabbering technique is perfect for everyone because it can be done anytime, anywhere and uses your own creative power as it’s fuel. Other reasons why this method is ideal is that it builds confidence through continual thinking and speaking and it keeps your attention. 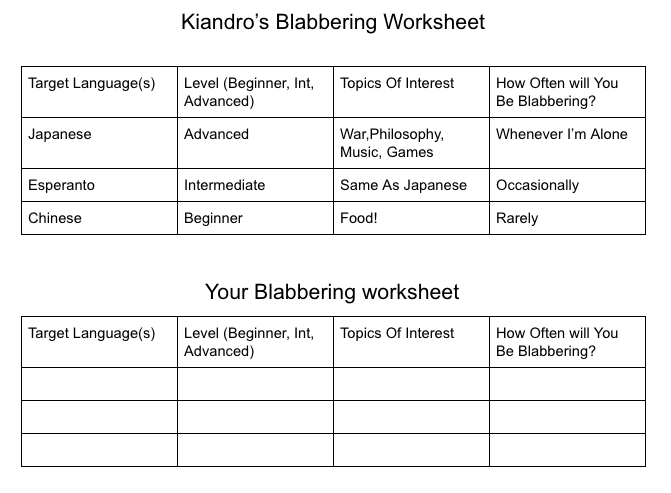 As always here is a worksheet for you to fill out to assist you with blabbering. I’ll use an example to start you off! We have more free time than we realize, so don’t worry about being busy. All you need is a few minutes to yourself to get those questions and statements out in the open. Blabber at a crosswalk, while shopping, or while waiting on the line in the bank. The important thing is to keep your thoughts flowing once you start. Follow this guide and you’ll be blabbering in no time. If you have any comments or thoughts on the Blabbering Technique leave a comment below. Stay tuned for more creative language learning tips, hints and tricks from this awesome series!